I love orzo pasta. It seems that any time I make something that contains orzo it instantly is transformed into a comfort dish that will be a repeat. My son was convinced that I was making pizza as dinner approached – and he didn’t believe me when I told him I was making chicken. It did smell like pizza. The scent of oregano, and tomatoes wafted through the air. I found this recipe in Cook’s Country Magazine April/May 2010 issue (30 Minute Supper card). I increased the amounts to accommodate my family of 5. In the end I had a large amount left over because the chicken breasts that I used were twice the size of the usual. It was yummy with just a little kick of spice. The orzo is dry roasted until slightly browned. Then the chicken breasts are browned and then finished in a simmer with the Orzo and tomatoes. You do not need to heat up your oven – if you skillet with fit everything. My skillet only had room for 3 of the giant chicken breasts, so I transferred them to a baking dish and did cook them in the oven, but only because the chicken pieces were so large. I should have split them and used just three. 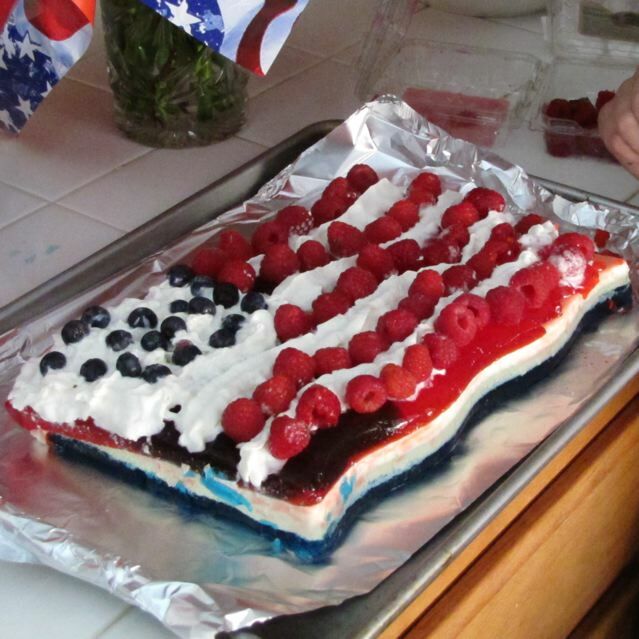 So if you are cooking this for a larger group you can bake them in the oven covered with foil (I had the temperature at 350 and baked them for 25-30 minutes). Dry the chicken breast halves with paper towels. Combine the oregano, red pepper flakes, salt and pepper in a small bowl and sprinkle each chicken breast half with the mixture on both sides. (Use less red pepper flakes if you don’t like it with much kick). Toast the orzo pasta in a large non stick skillet about 3-5 minutes shaking the pan from time to time until the orzo is golden brown. Remove the orzo and set aside for later use. Heat 1 Tbsp of the oil in the pan and heat over high heat until the oil is shimmering. Cook the chicken breast halves for 3 minutes on each side. Transfer the chicken to a plate. Pour remaining oil in the skillet and add the garlic, stirring for about 30 seconds until the garlic is fragrant. Add the diced tomatoes (with their juices), chicken broth, and toasted orzo pasta and bring the mixture to a boil. Top the pasta with the chicken breasts and any juices from the plate. Reduce the heat to medium-low and cover. Cook over medium-low for about 10 to 15 minutes until the pasta is tender and the chicken is cooked through. Top each serving with basil and shredded Parmesan cheese. 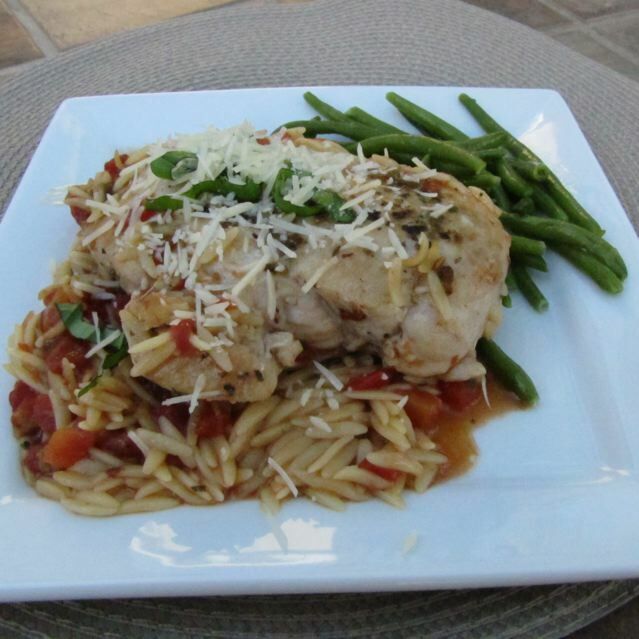 Categories: American Test Kitchen Recipe, Main Dish, Main Dish - Chicken, Main Dish - Pasta | Permalink. I recently was leafing through one of my many cooking magazines that litters my bookcase. Since peaches are at their peak, I wanted to make a quick dessert with them. 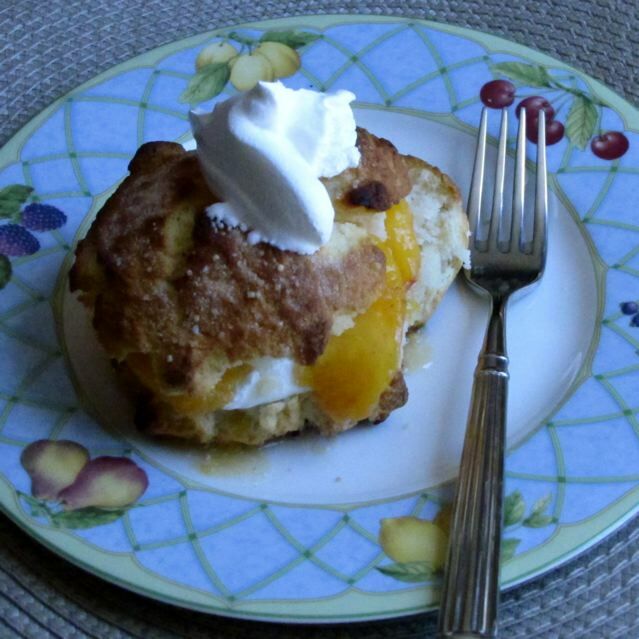 In the July/August 2008 issue of Cook’s Illustrated I found a recipe for Peach Shortcakes (page 23). I did change the whipped cream to cool whip because I had it on hand and would not have to fuss with making my own whipped cream. Since my children were eating it I also changed the peach schnapps to orange juice as they recommended. My one complaint with the recipe was that the biscuits burned in the 15 minutes at 474 F. I would either reduce the heat to 425 or cook it for less time. Toss 3/4 of your sliced peaches with 4 Tbsp of the sugar. Toss the remaining peaches with 2 Tbsp of peaches and 2 Tbsp of orange juice (or peach schnapps if you want to go that route). Microwave the smaller portion of the peaches with the orange juice in a microwave safe bowl for about 1 1/2 to 2 minutes on high. Use a potato masher to mash the peaches and combine them with the larger amount of peaches. Allow to sit at least 30 minutes – or overnight. Biscuits: Preheat oven to 425 (not 475 like originally instructed) with the rack in the middle position of your oven. Line a cookie sheet with either parchment paper or a silicone baking sheet (Sil-pat). Combine the dry ingredients together in a large bowl. Whisk together. In a smaller bowl, combine the buttermilk and egg and whisk to combine. Add the melted, and somewhat cooled butter and combine with the whisk. Add the liquids to the dry ingredients and stir with a wooden spoon until they are combined. Spray a 1/3 cup measure with cooking spray so the dough will not stick. Scoop 6 -1/3 cup size biscuits on the prepared cookie sheet. Form them into biscuits with your hands, but do not press down. Bake for about 15 minutes (watching carefully) until they are golden brown. Remove to a cooling rack for at least 15 minutes. To serve: Slice the biscuit in half lengthwise. Top with a spoon full of defrosted cool whip. Top with sliced peaches and juices. Top with the biscuit top and dollop with more cool whip. Enjoy! NOTES: I think next time I will make the biscuits with the Bisquick Mix and follow the directions for making the biscuits. I think they have better flavor. The kids loved the cool whip instead of homemade whipped cream. If you have whipping cream in the can, I am sure that will work as well. Categories: American Test Kitchen Recipe, Baking, Baking - Desserts, Dessert - Fruit, Desserts | Tags: Cook's Illustrated, Peach Shortcakes | Permalink. I received this recipe from my friend Kay. It is a really easy chicken recipe that is tasty and quick to make. Serve it with steamed rice and veggies to complete your meal. Combine the apricot jam, water, curry and salt in a small bowl and stir to combine. 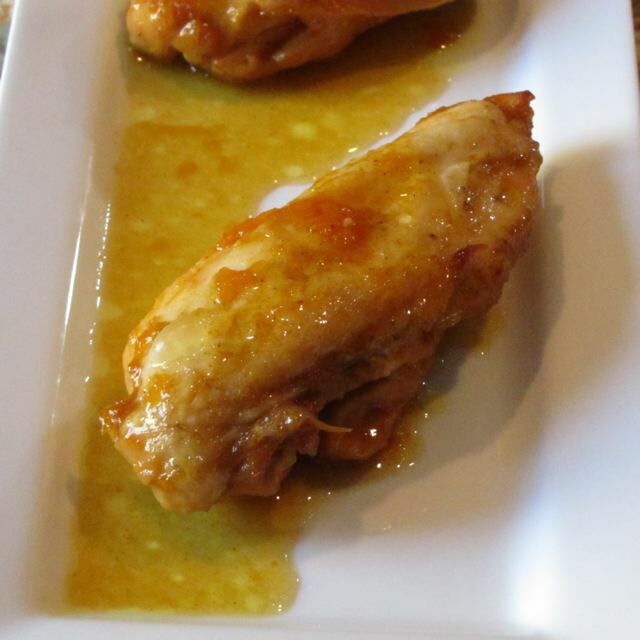 Pour the apricot mixture over 6 chicken breast halves in a 9x13x2 baking dish. Bake for 45 minutes or until the juices run clear. Categories: Main Dish, Main Dish - Chicken | Permalink. I love the soups that are offered at Olive Garden. The cookbook author, Todd Wilbur has a wonderful series of cookbooks that I have in my collection and enjoy browsing through. 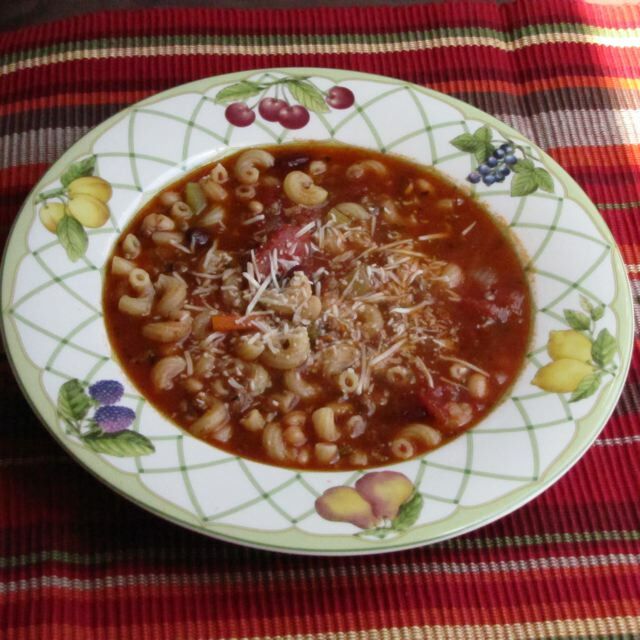 His book Top Secret Restaurant Recipes 2 has the Pasta E Fagioli Soup recipe that mimics the Olive Garden version very closely. I did not have every single ingredient on hand, but I had similar ones that worked. I did not have the V-8 juice that the original recipe calls for, so I substituted stewed tomatoes for diced and increased the tomato sauce to make up for it. The flavors were very good and everyone enjoyed it. Preheat a large 12 inch skillet over medium high heat. Brown the ground beef in the skillet and pour off any fat. I used a lean cut of ground beef, so there was very little fat. Add the chopped onion, celery and carrots and cook for 10 minutes, stirring occasionally. Add the remaining ingredients (except the macaroni). Bring to a boil, cover and reduce heat and simmer for about 1 hour. During the last 20 minutes of cooking the soup, cook the elbow macaroni in 2 1/2 quarts of boiling water according to package directions. You will want the pasta to be slightly under done. Drain the pasta and add it to the soup. Simmer for 10 more minutes. Serve with a sprinkling of Parmesan cheese and crusty French bread. Categories: Ethnic, Ethnic - Italian, Main Dish, Main Dish - Soups | Tags: Copycat Soup, Olive Garden, Pasta E Fagioli, Todd Wilbur | Permalink. It has been HOT here.. really HOT (well over 100 F)- and I wanted good food that did not heat up my kitchen. Out comes my trusty crock pot. 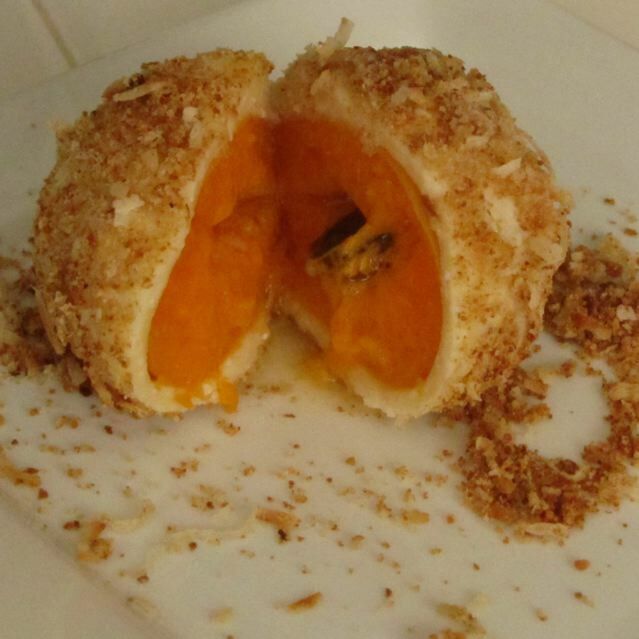 I adapted a recipe from the Food Network to make this recipe (link). Serve with Spanish rice and Guacamole. Place all the ingredients in a crock pot. Cook on high heat for 5-6 hours, stirring occasionally. Shred the beef with two forks and pour about 1/2 cup of the liquid over it for moisture. Serve with flour tortillas, cheese, sliced tomatoes, lettuce with Spanish rice and fresh guacamole on the side. 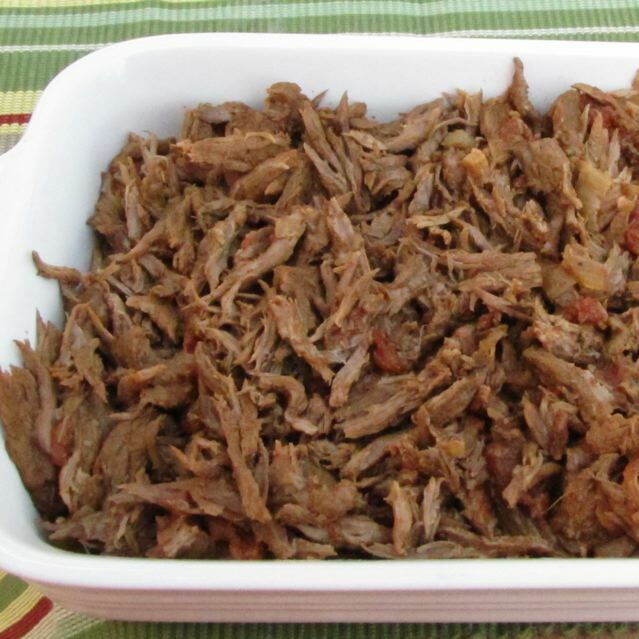 Categories: Ethnic, Ethnic - Mexican, Main Dish, Main Dish - Beef | Tags: Crockpot beef, shredded beef tacos | Permalink.